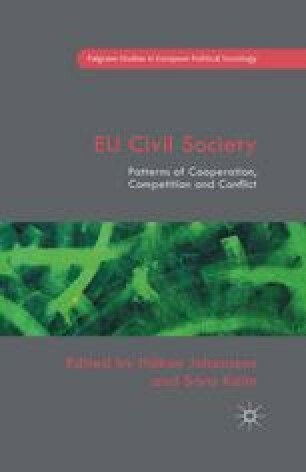 This chapter studies mechanisms of collaboration and patterns of coalition among a group of civil society organisations (CSOs) working on a range of social change issues at the European Union (EU) level, known as the Platform of European Social NGOs (‘the Platform’). The Platform is a Commission-sponsored and Brussels-based coalition of diverse European CSO networks and federations of voluntary and social welfare organisations formally launched in 1994. The Platform’s official functions are to facilitate informational exchange between its members, encourage their adoption of common policy positions and provide regular consultation with EU institutions on social policy matters. It is characterised by the diversity of its membership with organisations, ranging from women’s rights, anti-racism, sexuality and disability rights advocates to faith-based social service providers. While stratification exists between larger and smaller coalition members and ideological and strategic tensions shape internal dynamics, the Platform has survived for a couple of decades and now includes 49 organisations.